The album recorded in Paris, brings in the core of its research the Afro-Brazilian rhythms from 'Recôncavo baiano' as well as the charm and subtlety of bossa nova. The album is a journey through the landscapes of Dori Caymmi, the finesse of Tom Jobim, and the poetry of Caetano Veloso. In the show 'Where Rio de Janeiro meets Bahia', Mario and Edmundo promise to transport the audience to a place where the real and the imaginary are experienced and enhanced by poetry and music. 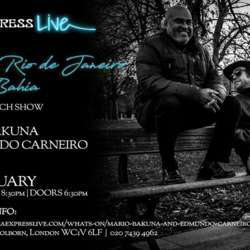 Mario Bakuna is a London-based Brazilian composer, singer and guitar player, with over fifeen years of professional experience. He is a graduate of the Free University of Music in Sao Paulo, Brazil. Whilst there he studied with musicians such as: Olmir Stocker, Roberto Sion and Roberto Bomilcar (pianist who played with Frank Sinatra during his visit to Brazil). His study focuses on Afro-Brazilian music, Samba, Jazz and Bossa Nova. He travelled to Europe to expand his research, and since moving to London, he has been performing alongside musicians such as Jean Toussaint, Liam Noble, Roberto Manzin, Ricardo dos Santos, Edmundo Carneiro, Cacau Queiroz, Alain Jean Marie, Filó Machado, and Andrew McCormack. Edmundo Carneiro is a Brazilian percussionist based in Paris for over 30 years, Edmundo Carneiro toured over 66 countries and worked with international music figures such as Baden Powell, Tânia Maria, Steave Gadd, Ana de Hollanda, Rosinha de Valençia, Antony Jackson, Monica Passos, Chucho Valdes. Percussionist of his own style, Carneiro also experienced successfully electronic music by working with several artits and DJs such as Saint-Germain, Next Evidence, Bob Sinclar, Schazz, Rive gauche, Charles Schilling, Stéphane Pompougnac.